Also serving communities of Wisconsin Dells, Reedsburg, Hillsboro, Richland Center. There are 6 Assisted Living Facilities in the Baraboo area, with 5 in Baraboo and 1 nearby. The average cost of assisted living in Baraboo is $3,279 per month. This is lower than the national median of $3,346. To help you with your search, browse the 6 reviews below for assisted living facilities in Baraboo. On average, consumers rate assisted living in Baraboo 4.2 out of 5 stars. Better rated regions include Waunakee with an average rating of 4.4 out of 5 stars. Caring.com has helped thousands of families find high-quality senior care. To speak with one of our Family Advisors about assisted living options and costs in Baraboo, call (855) 863-8283. Baraboo, famous for being the birthplace of the Ringling Brothers Circus, is a city in Sauk County, Wisconsin. The community has a large senior population, with 17 percent of its 12,000 residents being 65 years or older. There are 10 assisted living facilities located in the Baraboo area, and five are within city limits. These facilities, like their counterparts in the rest of Wisconsin, are licensed by the state Department of Health Services. In Wisconsin, assisted living facilities are designated as community-based residential facilities and are home to five or more residents. Like other communities in Wisconsin, Baraboo has a much less comfortable climate than the national norm. Winter lows are in the single digits, and an average of 43 inches of snow falls each year. Seniors who enjoy winter activities, such as cross country skiing or snowshoeing, may consider this a benefit. Seniors in Baraboo benefit from Wisconsin’s retiree-friendly tax policies. The state doesn’t tax Social Security benefits, and it also doesn’t tax some types of pension income, such as payments from the U.S. military retirement system. Baraboo Transit, a shared ride provider, offers discounted fares to seniors. The service operates throughout the city of Baraboo, and trips outside of city limits are offered for an additional fee. Seniors can also purchase discounted taxi rides through Sauk County’s Aging & Disability Resource Center. The Baraboo area is home to world-class medical facilities, including SSM Health St. Clare Hospital - Baraboo, in the event of medical emergencies or illness. There are plenty of arts and culture opportunities for seniors in Baraboo. Seniors who are interested in the city’s unique history can visit Circus World Museum at a discounted price, which features circus exhibits and live circus performances. Adventurous seniors can go hiking or canoeing in Devil’s Lake State Park. The cost of living in Baraboo is 12.5 percent lower than the national average. This is mainly due to the city’s lower-than-average housing prices, though transportation and health care costs are also below average. Assisted Living costs in Baraboo start around $3,279 per month on average, while the nationwide average cost of assisted living is $4,000 per month, according to the latest figures from Genworth’s Cost of Care Survey. It’s important to note that assisted living rates in Baraboo and the surrounding suburbs can vary widely based on factors such as location, the level of care needed, apartment size and the types of amenities offered at each community. 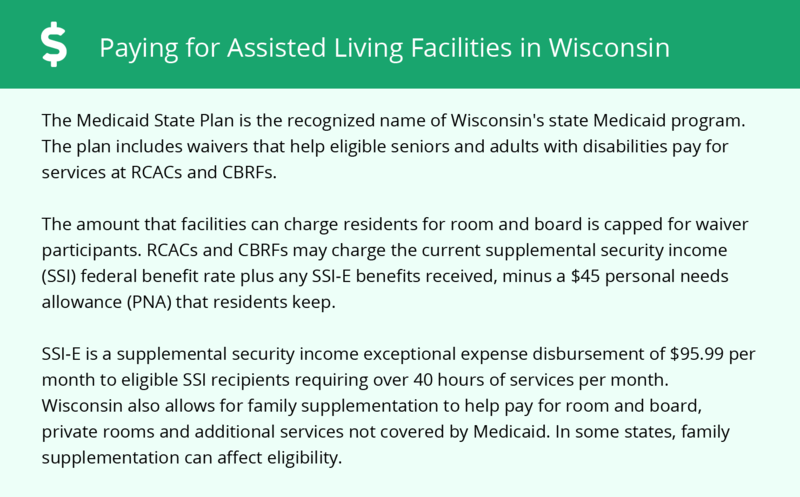 Wisconsin’s Medicaid system, the Medicaid State Plan, supports a waiver that may help seniors pay for care in assisted living facilities. 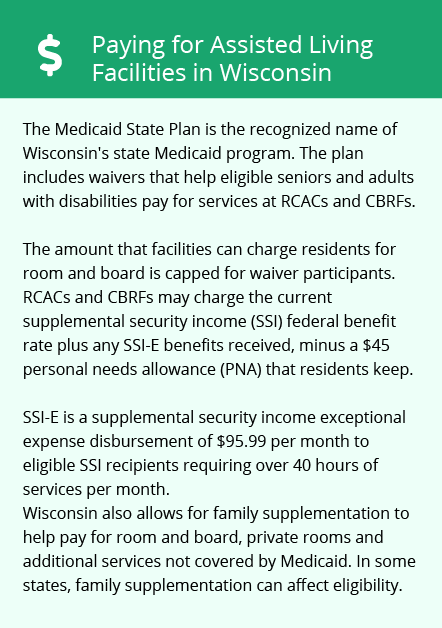 Seniors who receive federal Supplemental Security Income benefits may be eligible to receive an exceptional expense payment from the state. Baraboo and the surrounding area are home to numerous government agencies and non-profit organizations offering help for seniors searching for or currently residing in an assisted living community. These organizations can also provide assistance in a number of other eldercare services such as geriatric care management, elder law advice, estate planning, finding home care and health and wellness programs. To see a list of free assisted living resources in Baraboo, please visit our Assisted Living in Wisconsin page. Baraboo-area assisted living communities must adhere to the comprehensive set of state laws and regulations that all assisted living communities in Wisconsin are required to follow. Visit our Assisted Living in Wisconsin page for more information about these laws.